–The insertion in a network of actors that provides access to expertise and resources necessary to its development (technology, human and financial capital). The incubators operate as intermediaries between the incubated companies and the external environment. Business accelerator: help companies overcome adolescence and preparing to enter adulthood, providing them arms and sturdy legs, sound values and a clear mindset (strategy) for the future. NB: : In other words, while the incubators help companies to stand and walk during childhood, accelerators teach companies to “operate” by guiding them from adolescence to adulthood. 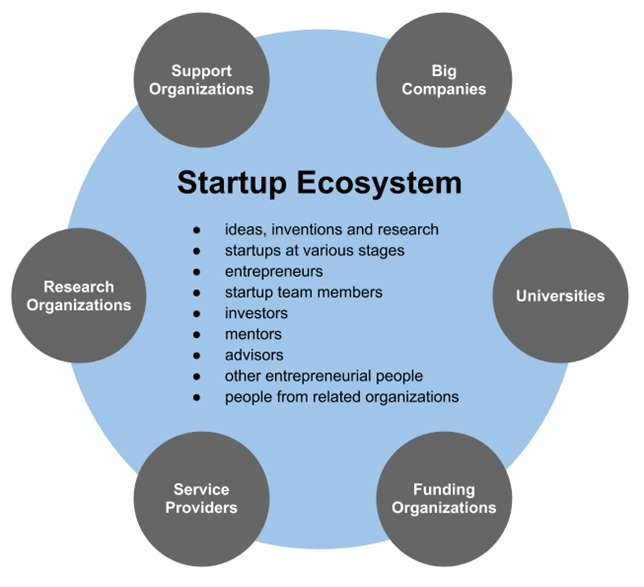 A startup ecosystem is made up of people, startups in their various stages and various types of organizations in a location (physical or virtual), which interacts as a system to create new startup companies. These organizations can be further divided into categories such as universities, funding organizations, support organizations (such as incubators, accelerators, co-working spaces, etc. ), research organizations, service provider organizations (such as financial services, legal, etc. ) and large companies. Most of these organizations typically focus on specific parts of the ecosystem function, and on start-ups depending on their development stage. As we can see a startup ecosystem is quite complex. It is however most relevant to the support of startups, and thus, their chances of success.